Panorama T4 & T6 are the first controllers to deliver Nektar-level instrument plugin control in any VST/AU compatible DAW. Load patches directly from the keyboard and start controlling parameters immediately, with every change instantly visible on the LED display. Control any instrument plugin with one of the many included maps or customize and create your own. Discover new performance tools like the powerful chord, hold and note repeat functions. Tweak repeat parameters, plugin parameters and record it all in your DAW. Panorama T4 & T6 connect to most DAWs delivering track navigation, mixer and transport control with either Nektar DAW integration or MCU compatibility. Experience the unsurpassed integration of Panorama T4 and T6! 49 or 61 note 2nd Gen synth-action keyboard with aftertouch. 8 super-sensitive pads with pressure. Chord: Trigger up to 6 notes from one key or pad. Hold: Holds played notes until deactivated – great with legato. Real-time control of trigger rate, accent, swing and gate. Separate settings for keys and pads. Switch on/off at any time with dedicated repeat buttons. Control velocity with pressure or wheels. Loads in any VST/VST3/AU host DAW for instant access to Nektar plugin control. Customize mapping or create plugin maps from scratch. Browse patches directly from Panorama T4/T6. Layer up to 8 VST/VST3/AU plugins with mix control of volume, pan, mute, solo and select. Nektar DAW integration for Bitwig, Cubase, GarageBand, Logic, Nuendo, Reason and Reaper. MCU compatible for control of almost any other VST/AU DAW. 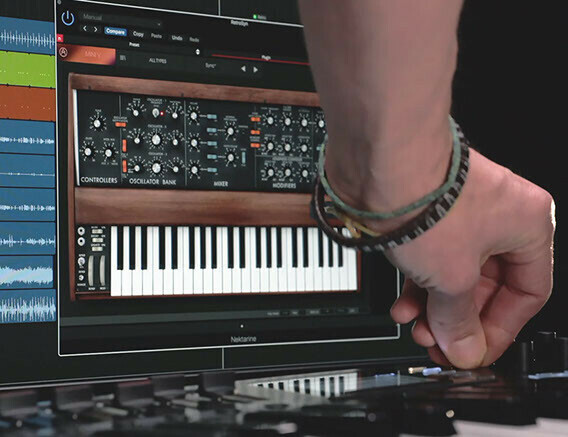 Panorama T4 and T6 feature a 2nd generation Panorama synth-action keybed. Dampened and carefully balanced across the keyboard with medium tension, which means the activation force required is in the middle of the range established for professional keyboards. Five velocity curves shift the emphasis from soft to hard, giving enough choice to cater for any playing style. A fixed option enables velocity values to be set by controls, including the wheels. Designed with finger drumming in mind, Panorama T4/T6’s 8 large velocity and pressure sensitive pads are the perfect tool for beat creation. Triggering at an extremely low threshold, they will capture ghost notes and flams as easily as you can play them. If the factory settings are not expressive enough for you, it’s even possible to calibrate each pad individually for optimum performance. 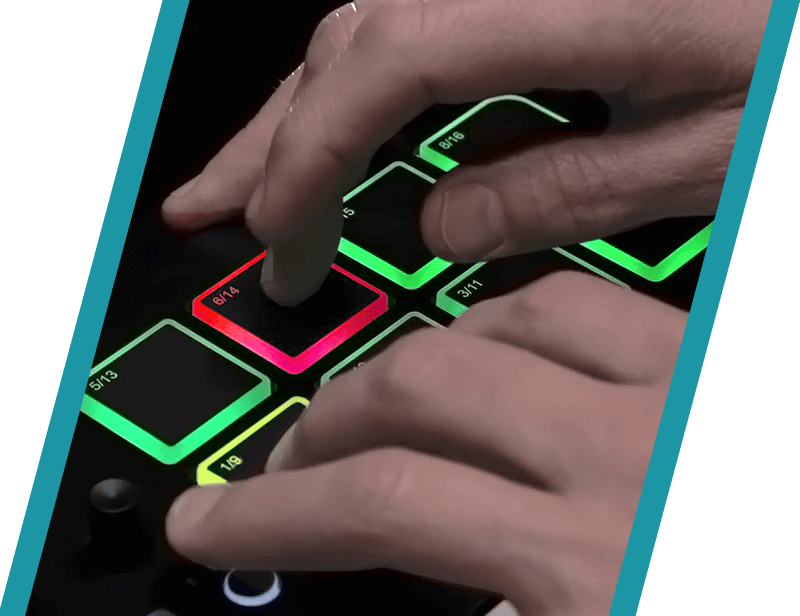 Each pad can be assigned any MIDI note number or MIDI cc message for use as MIDI trigger or toggle buttons – and assigning sounds couldn’t be easier: Activate Pad Learn, select a pad, play the required note or drum sound on the keyboard and assignment is done. A Pad Bank Button left to the pads gives you access to another 8 pads, for a total of 16 pads within a pad map. 8 such pad maps are available for recall at any time. With DAW Integration, you additionally get automatic mapping of dedicated drums synths such as Reason’s Kong and Bitwig’s Drum Machine for a tightly integrated drum machine feeling, complete with full visual feedback on the pads. You can even assign chords to the pads and combine this with the Pad Repeat feature to generate fun rhythmical and chordal figures. The display’s “Velocity Spread” softkey quickly spreads the last played note across all 16 pads, each with its own fixed velocity, making it easier to create consistent and nuanced dynamics. And “VelFix” gives you access to a pre-assigned fixed velocity level. Located just above the wheels are the Key Repeat and Pad Repeat buttons. Press to activate the repeat function and notes will be repeated at the set rate. Change the rate in real-time from 1/4 – 1/96 note values, change the tempo, add some swing and set an accent interval. Repeat settings for pads and keys are independent of each other, so one can be set for the drum beat and the other for an instrumentation part. The Repeat’s trigger mode can be set to repeat from the point of playing a note or to sync with the beat. Clock source can either be internal or external MIDI clock. Repeat is a fun way to look for ideas and facilitate “happy accidents”, regardless of whether you are adding flams to drum beats or creating big repetitive chord progressions. Nine 30mm faders, 8 assignable LED buttons and 8 encoders are at the center of the T-series’ control panel. Each control is fully programmable to send any MIDI CC message for use with hardware or software MIDI products. Our “Null” function additionally allows you to do this without relying on software feedback with independent settings for each of Mixer, Instrument, Multi and Preset modes. Control settings can be stored in any of Panorama’s 10 presets for recall at any time. The custom LCD display provides crisp and clear feedback for all your settings: Here is where you select Panorama’s different modes, access global parameters and navigate your software. With DAW Integration and Nektarine, you will even see your software’s mixer and plugin parameters right there. By pressing the FOCUS button, you can enlarge the current parameter to fill the whole screen. All of this ensures a fluent and fast workflow without any guessing games. No doubt, there will be plugins out there not yet factory mapped for Nektarine: no problem! Click the “Edit” button in the Nektarine header to open the control edit page. This is where control map pages are created. You can also rename parameters and create navigation assignments so it’s easy to select the plugin’s pages. Drag and drop parameters to assign them to controls on each page or use Panorama’s parameter learn function. Factory maps are also customizable and any map can be saved for automatic recall every time the plugin is loaded. 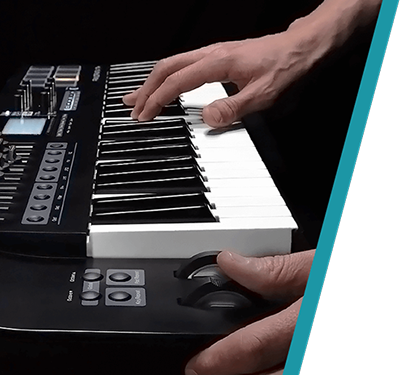 Nektarine and Panorama T4/T6 deliver an unrivaled control experience with deep integration typically not even available on dedicated hardware synthesizer products. With this level of control you’ll see your instruments in a new light. Nektarine’s browser enables browsing of patches directly from Panorama T4/T6. Factory patches for most of the popular instrument plugins are instantly available with minimum setup. Your own user patches can also be imported or saved, so over time there will be quite a few patches to choose from in the Nektarine browser. Thankfully, Nektarine has all the tools to help you manage thousands of patches – including patch tagging, search and rating options which make it easy to find exactly the patch you are looking for. Group tags store a combination of tag settings and make it possible to narrow your options at the push of just one button. The best part is that the Nektarine browser allows complete migration between DAWs: Use Nektarine in one DAW and your plugins can be browsed the same way in any other compatible DAW. You hardly notice it, but it’s there. Nektarine is discreet and doesn’t impose itself on you or your DAW. But behind it lies a powerhouse of features that enhance control and library management of instrument plugins. Launch Nektarine and it will immediately communicate with your Panorama T4/T6. Now you are ready to take deep control of VST, VST3 or AU plugins from Panorama: Load an instrument plugin that’s supported by Nektarine’s default plugin maps and create new and exciting sounds that you didn’t even know your plugin was capable of. Turning knobs is so much more fun than mousing around. The display will tell you which parameter is assigned to each control as well as status feedback. The LED buttons below the faders are set up for navigation so it’s quick and easy to find your way around even complex plugins. Each button is labeled with a common control page name such as OSC, Filter, Env, LFO and FX. As soon as you press a button, the corresponding Nektarine factory map page is selected. The LED buttons can be “learned” to any map page so you can set up each map exactly how you want it. 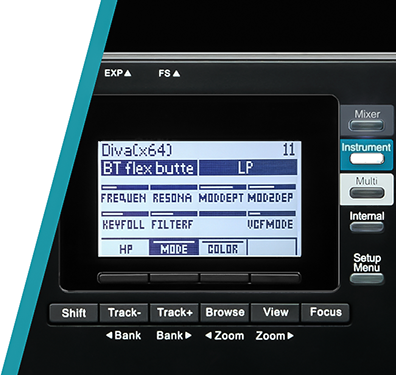 Panorama T4/T6’s Multi mode enables up to 8 instrument plugins to be layered in Nektarine. Each plugin slot has its own unique browser settings as well as volume, pan, mute and solo parameters assigned for instant mix from Panorama. When Multi mode is active, patches loaded for each slot are clearly listed in the display and slots can be added in real-time. Press the Browse button at any time to load a new patch in any of the active slots. Multi definitely means more! Panorama T4 and T6 are compatible with any DAW that supports Mackie® Control Universal (MCU). This includes transport, track selection and basic mixer control. The 6 LED transport buttons put an end to using the mouse for this. Dedicated Track up/down buttons are located below the display. If your DAW is supported by Nektar DAW Integration, you can do even more. Control basic mixer functionality right away: The first 8 faders control your DAW’s mixer in banks of 8 channels each, their LED buttons activate mute. And this works in any DAW, that supports MCU. Hold shift and move through your mixer in banks of 8, using the Bank buttons below the Display. The 9th fader controls master volume, the encoders are mapped to channel pan. 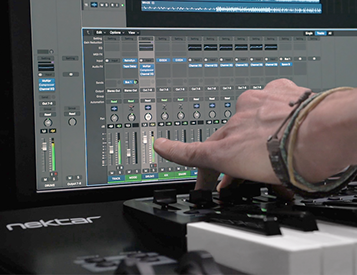 With Nektar DAW Integration, you get extended features such as alternating channel 9 between volume control for master and current channel – or toggling the LED buttons between solo and mute. Depending on your DAW, you can also use the display buttons to switch the encoders to control sends or smart/quick controls in Logic or Cubase for example. To help you make the best out of your screen estate, Panorama also has shortcuts for opening and closing your DAW mixer window. Nektarine and MCU DAW control create a powerful system. Our Nektar DAW Integration software takes the system integration even further: This custom software is especially created for each of the supported DAWs and will provide you with a common workflow that gives access to expanded transport and mixer functions as well as control of your DAW’s own instruments. It’s the most complete DAW control system available, even compared with products in higher price brackets. Panorama T-series’ DAW integration currently supports Bitwig, Cubase, Garageband, Logic, Nuendo, Reaper and Reason. Extended transport control with Goto Left locator, Set L and Set R locators, Undo, Click and Record Arm. Mixer mode with display feedback, track listing, volume, pan and sends control. Control of Smart/Quick Control in Logic and Cubase/Nuendo. Dedicated maps for DAW’s own included instruments. Basic mapping of plugins not hosted in Nektarine, offering 2 encoder pages and one fader control page. Grab/learn parameters – take control of any parameter on the active instrument immediately. Automatically detects and manages communication with Nektarine when inserted on a track. If you prefer to control MIDI hardware products, Panorama T4/T6 can do that as well. The Control Edit menu makes it easy to program any of the controls to send MIDI messages from standard MIDI cc, RPN and NRPN, MMC and of course note messages. Buttons and pads can even be set up to load specific Panorama T4/T6 presets or pad maps as well as trigger chords. There are 10 presets to store control setups and a further 8 pad maps storing 2x8 pad assignments each. Once controls are programmed as they should be, connect your MIDI equipment to the MIDI output jack and get started. You can use the repeat buttons to expand your performance options as well as of course the chord and hold functions. As a low powered USB device, Panorama T4 and T6 work with all USB devices that feature a Class compliant MIDI driver. This includes all version of Windows from XP and higher, Apple OS X 10.5 and higher plus Linux (as long as a USB MIDI driver package is installed). Apple iOS is supported using Apple’s powered USB camera connection kit. For Nektar DAW integration and Nektarine, you’ll find the system specifications at the end of this page. Bitwig 8-Track is included with every Panorma T4 and T6. So you can start producing, performing, and designing sounds like a pro from day one. Bitwig 8-Track gives you access to over 50 software instruments and effects for use on up to 8 audio or MIDI project tracks, and you can use any 3rd party VST plug-ins you might own, too. The ‘Bitwig Essentials Package’, a highly versatile handpicked selection of loops, clips and samples, is also included to help you get started. 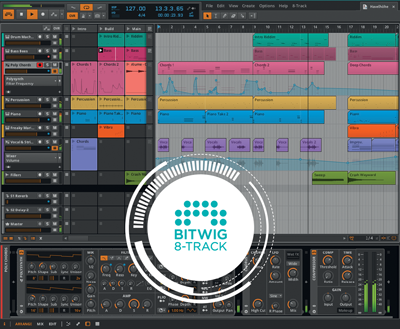 So put all that together and you have a powerful sketchpad for your musical ideas featuring the acclaimed workflow of Bitwig Studio. 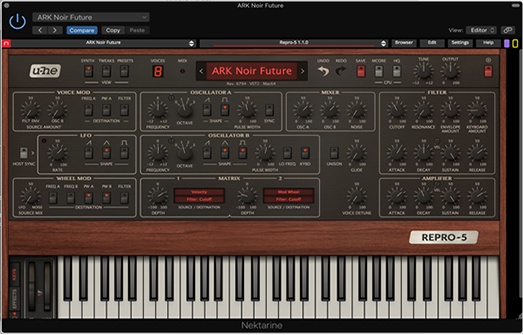 Nektar DAW Integration supports Bitwig 8-Track, so using Nektar Panorama T4/T6 and Bitwig 8-Track together is a fantastic combination. If you are just starting out, you will find it’s the perfect way to take your first steps in the world of digital music creation. And if you’re already familiar with using computer software, then you’ll be amazed at what this combination has to offer! Focus function displays current parameter line in large font. Windows XP, Vista, 7, 8, 10 or higher. Linux with Bitwig or as USB class MIDI device. Firmware update required on either Windows or Mac OSX. Firmware not updateable on Linux. Nektar DAW Integration: Windows Vista, 7, 8, 10 or higher. Mac OS X 10.7 or higher. Check Nektar DAW Integration documentation or marketing information for support of legacy DAW versions. Nektarine: Windows 7,8,10 or higher. Mac OS X 10.7 or higher.